Nigubian(g pronounced as j) kids arrive! I have been waiting for my Nubian doe, Dixie, to deliver for 6 weeks now. I got all excited when she first started to make a bag and then learned that first kidding goats start getting ready a long time before they are due. This is the opposite of maiden mares, who often don’t bag up at all until they actually foal. 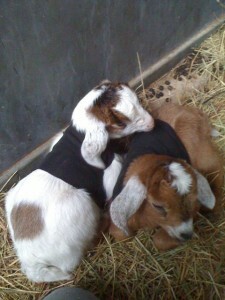 Some might wonder why I have added breeding dairy goats to my already packed schedule. Believe me, I have asked myself the same question. I started with 1 rogue Nubian named Sally. She had been given to my cousin and he in turn gave her to me. Sally was half wild and hated to be touched. Learning to milk with her about gave me a complex. With time, Sally and I came to an agreement about the milking and I loved drinking the goat milk and making cheese. Sally had twins, Sissy and Prissy. I kept Sissy and she had 2 girl kids, Dixie and Trixie, that I also kept(you see the pattern here). After working with the purebred Nubians I decided that crossing them with another breed might give me a gentler, heartier milk goat. Nubians are kinda like the Thoroughbred of milk goats. I wanted to produce a dairy goat that I could lease out to families who wanted the milk but did not want to deal with the breeding and raising of kids. It is amazing how many people don’t realize that you have to breed a goat to get milk. Unfortunately they don’t come with an on/off switch. This entry was posted in Other Stuff on December 6, 2011 by Madalyn Ward, DVM. Pingback: Learn Horseback Riding » Nigubian(g pronounced as j) kids arrive!